I need to have cookies on hand and I hate to rely on store-bought cookies. One of my favorites is oatmeal but I’m not that crazy about putting healthy raisins in so I sub chocolate chips, which if I’m not mistaken has some health benefits too. This recipe is on the bottom of the Quaker Oats cover (just a couple of modifications such as the chocolate chips & extra vanilla) but I’ve been meaning to type it up because I live in fear that some day they will no longer put the recipe there and it will be lost forever. And, an interesting discovery while I was making these cookies… I spilled 1/2 cup of the oats on the floor and before I could clean the mess up, Lola had scarfed up every little morsel. I had no idea she might eat raw oats but it led me to come up with a new recipe just for her. Soon to be posted: Oatmeal/Sweet Potato/Parm Cheese K-9 Cookies. But first here’s your version so you’ll have something to munch on while making the puppy variety (p.s. careful to not leave the K-9 cookies on the counter without telling your husband who they’re for). – Bake 8-10 minutes at 350° until light golden brown. 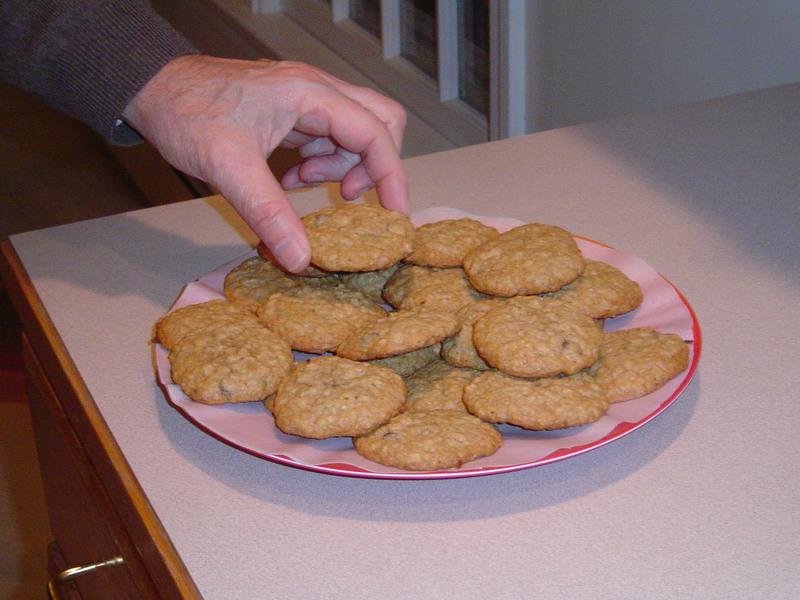 This entry was posted in desserts, recipes and tagged cookies, oatmeal chocolate chip, recipes by dianeskitchentable. Bookmark the permalink. Well he already does that but he almost grabbed from the wrong plate! I would love to try those peanut butter doggie treats. I’ll have to bring some of the sweet potato ones over for Dixie to try. I figured it wasn’t a fair test to just see if Lola would eat them so we had an impartial panel of experts over here Sunday. 3 out of 4 liked them…Lola was a little upset cause everyone was eating all her cookies.